Crystal Fighters "...continues to transcend musical barriers" as JAY-Z's LIFE + TIMES first described the UK-based / Basque-influenced electronic-folk inspired sophomore album CAVE RAVE with their diverse remix EPs, which resumes now with "Love Natural (Remixes Pt.2)" out March 3rd via Atlantic Records to all DSPs. The new six-track EP includes fresh takes from Dutch producer Knight One, London DJ Jonjo (The Lovely Jonjo), and upcoming UK producer Sonic Tramp, who is known for his remixes of MGMT, Friendly Fires and Bon Iver. The package also includes remixes from Buffetlibre, BILBANDINO, and Twiggy Garcia & Stacey Edwards. 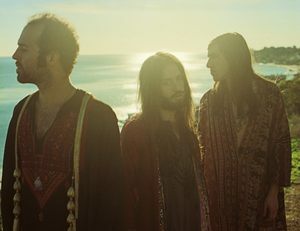 Previous Crystal Fighters remix releases include "You & I (Remixes)," "Wave (Remixes)," "LA Calling (Remixes)," and the first package of "Love Natural (Remixes)," supporting the band's unforgettably uplifting single with a video accompaniment to prove it, also featured on the Fifa'14 official soundtrack. Also, today Crystal Fighters announced a short North American west coast run which kicks off at Sasquatch Festival on May 23rd and completes in Mexico City on May 30th. Be sure to catch their "foot-stomping, hand-waving romp of frenetic movement" (Billboard).